Columbus Day was anything but a holiday for investors. U.S. stocks got creamed again. The Dow slid another 223 points. 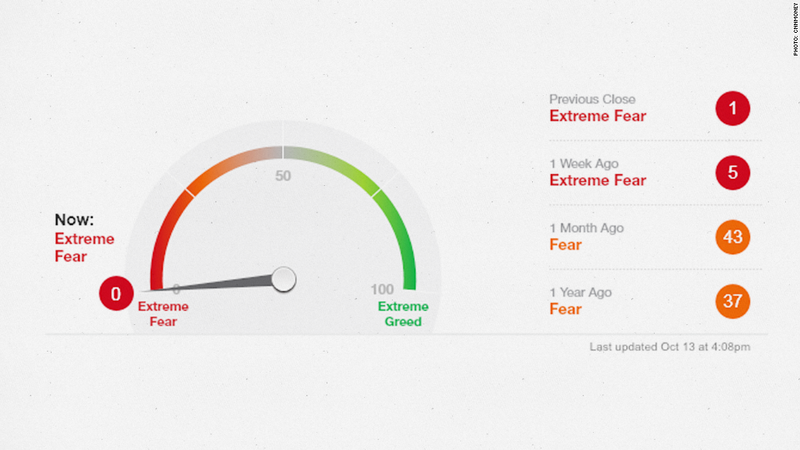 CNNMoney's Fear & Greed Index is a good indicator of market momentum. Today it hit zero. That's a huge red flag and showcases extreme fear in the stock market. The only other time the index ever touched that low point is in August 2011 -- shortly after Standard & Poor's downgraded the U.S. debt. Volatility -- or what some are calling "market whiplash" -- is clearly back in the market. The VIX, an index that measures volatility and is one of the factors that goes into the Fear & Greed Index -- spiked again today. It's up a whopping 60% in the past week alone. For most investors, what really matters is the bottom line. A month ago, the S&P 500 was up around 8% for the year. After a wave of sell-offs, including on Monday, the S&P 500 is only up 1.4%. It's worse for the Dow, which is now down 1.5% for the year. What's driving the latest market slide? Many thought today would be light trading and little action because of the holiday. Ebola was the most obvious fear factor and the worst bout of selling came in the final hour of the market. The airlines were hit hard -- Delta (DAL) dropped over 6% and Southwest (LUV)fell 5.5% -- on worries that vacationers and businesses will curtail travel until the virus is contained. On the flip side, Lakeland Industries (LAKE), a maker of hazmat suits -- soared nearly 50%. But the tension is the market seems deeper than just Ebola or even ISIS. There's ongoing worry about how unhealthy Europe's economy is. There was little data out Monday, but more members of the Federal Reserve are starting to voice concern about what's going on around the globe. The market also crossed an important barrier. The S&P 500 dipped below its 200-day moving average. That's akin to an A student suddenly scoring a B or C grade on an assignment. 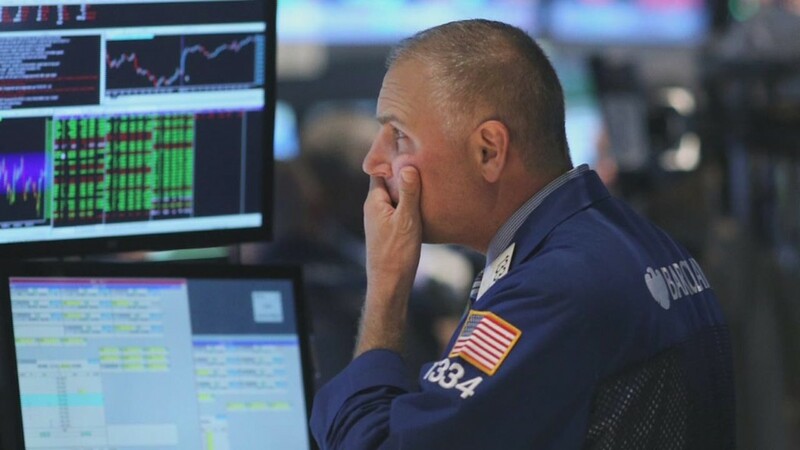 "The 200-day has not been breached since 11/08/12," said Randy Frederick, Managing Director of Trading and Derivatives at the Schwab Center for Financial Research. The S&P 500 ended the day at 1,875. Tech stocks get hit: Energy and tech stocks also got shaved. Oil continues to trade around $85, a low point not seen for over two years. While cheap gas could help consumers, it translates to lower profits for shareholders of energy companies. Halliburton (HAL) and Chesapeake Energy (CHK) were among the worst performers in the S&P 500 Monday. Smaller tech companies were the first to slip in the sell-off that started in September. Now larger companies are joining the plunge. Today Twitter (TWTR) shed 3.8%, Yahoo (YHOO) fell 3.1%, and Netflix (NFLX) was off 3%. What's next? No one has a crystal ball on the market. Some are calling this a buying opportunity as the market dips. "thank all for selling i am a strong buyer here Bullish," wrote bbar on StockTwits, a social media platform for traders. Others see a rough end to the year. "If market doesn't catch a bid from earnings, I wager we have our first negative year since 2009," commented PharoahNC on StockTwits. Despite being down sharply in recent days, The S&P 500 isn't even in a true "correction" yet. It's down just shy of 7% from its highs. A correction would constitute a 10% drop. A number of prominent companies will report earnings Tuesday including JPMorgan (JPM), Citigroup (C) and Wells Fargo (WFC) in the morning and Intel (INTC) after the bell. Their results will likely set the tone for trading.